By July 75, Elvis had already completed his last proper recording session. The Vegas season in March/April was dominated by brilliant shows alternating with several poor ones. The spring tour had been pretty average, while the one in June showed a very relaxed Elvis who was obviously enjoying himself on stage, as documented on such discs as Sold Out In Dixie, Deep Down South, Elvis Aron Presley (BMG), Cut 'em Down To Size and Let Me Take You Home. Shortly after this tour, Elvis had a brief hospital-stay, where he had the skin under his eyes tightened, without that being visible for someone who didn't know it. When he was back on the road on July 8 in Oklahoma City, he started a tour that today stands out as one of the best of his entire career. 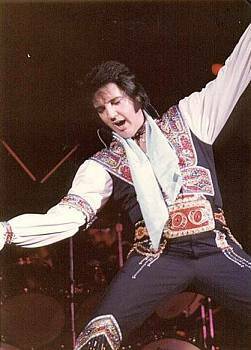 The first shows were of pretty normal 75 standard, but towards the end, Elvis held one of his most memorable concerts ever, the matinee show in Uniondale, NY, July 19, 75. This concert was released on the legendary LP/CD America's Own and featured an improvised gospel medley with Charlie Hodge, 'Bosom Of Abraham/You Better Run', as well as powerful renditions of 'Trying To Get To You' and 'You Gave Me A Mountain'. 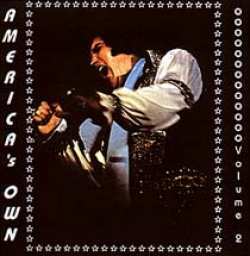 America's Own Vol. 2, released under the "Claudia"-Label back in 1991, contains the complete evening performance of the same date. This show is every bit as good as the matinee concert and the sound of it is much better, in fact, it's one of the best audience recordings around. Uniondale July 19, in his "Gypsy Suit" Powerful versions of 'See See Rider' and 'I Got A Woman/Amen' open the set. Elvis soon delivers a dynamic 'Big Boss Man', an emotional 'The Wonder Of You' and a rocking 'Polk Salad Annie'. The oldies are trashed as usual, although 'Love Me Tender' is rather different this time, sung solo at the beginning ("take the pill") and ending in a typical 70's way. Introductions reveal a somewhat "dark" side of Elvis. "Bill (Baize) is the kind of guy that's not ashamed to show affection in public. Kathy Westmoreland will show affection anywhere...in fact she gets it from the whole band". Kathy obviously didn't like that kind of Elvis introducing her (he had done it that way several other times before at this tour) and one night later in Norfolk, Virginia she left the stage during the introduction, alongside Estelle Brown and Sylvia Shemwell of the Sweet Inspirations, due to some unfriendly Elvis-comments. Elvis later apologized to all involved and presented them rings $5000 a-piece. But back to the show; 'T-R-O-U-B-L-E' follows the introduction, and finally Elvis learned how to perform it live; earlier renditions during the two previous tours were either messed up lyric-wise or simply rushed through. But this time it's pure dynamite and contains a long "ride it, walk it"-ending, with some karate exercises displayed by the king. One more time Elvis tries to break up J. D. Sumner during 'Why Me Lord', of course successfully. 'How Great Thou Art' again lifts the roof of the building, especially when Elvis hits some real high notes at the culmination of the reprise section. After a rather standard 'Let Me Be There' something unexpected happened: for some inexplicable reason, Elvis sat down at the piano, something he had never done before on tour, tentatively hit a few chords, then started singing: "when you walk through a storm...". Elvis delivers a full-blooded version of 'You'll Never Walk Alone', and today this performance, the only known live version of this song, stands out as one of the real great moments in an Elvis concert. It's simply pure Elvis magic and the audience seemed to notice how privileged they were to be there, as the ending is met with enthusiastic applause. A real shame that this song still hasn't turned up in soundboard quality! After standard versions of 'Funny...' and 'Little Darlin'', the concert could be over, but Elvis delivers one more rarity: 'I'm Leavin'' was standard during the second Vegas season and November tour 1971, but only occasionally sung afterwards, and by spring of 75, it hadn't been performed for some time. Elvis, however, included it at the evening show in Huntsville, Alabama May 31 and here again he delivers a gentle version. The tour, apart from the annoying incident in Norfolk, continued on a very high level. The three last shows in Asheville featured gems like 'Why Me Lord' sung by Elvis himself, 'Memphis Tennessee', 'Turn Around, Look At Me', 'Shake A Hand', 'Wooden Heart', 'Return To Sender' and the only live version of 'Pieces Of My Life'. The only soundboard recording known to exist from this tour is Cleveland, July 18, I sure hope some more will turn up in the future. "When he is putting out as he did Saturday afternoon, reaching for the top notes and shaping phrases with the same easy individuality that has always marked his best work, he is still the king."